The team at THE LAB found that a 2 kW Ambrell EASYHEATTM induction brazing system with a specially designed single position, three-turn coil would be the right solution for the application. The client noted that they may also need to heat smaller parts within a tighter time frame, and this coil and power supply was capable of meeting that objective too. 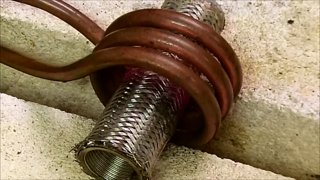 Testing concluded that the 2 kW EASYHEAT can heat the 7/8" (22 mm) steel tube and external wire braid to 1400 oF (760 oC) within 20 seconds, exceeding expectations. Benefits of this solution from THE LAB include speed, the minimal footprint required by the EASYHEAT unit and the ease-of-integration into the client's manufacturing process. To learn more about induction brazing, one of Ambrell's most popular applications, visit our brazing guide.